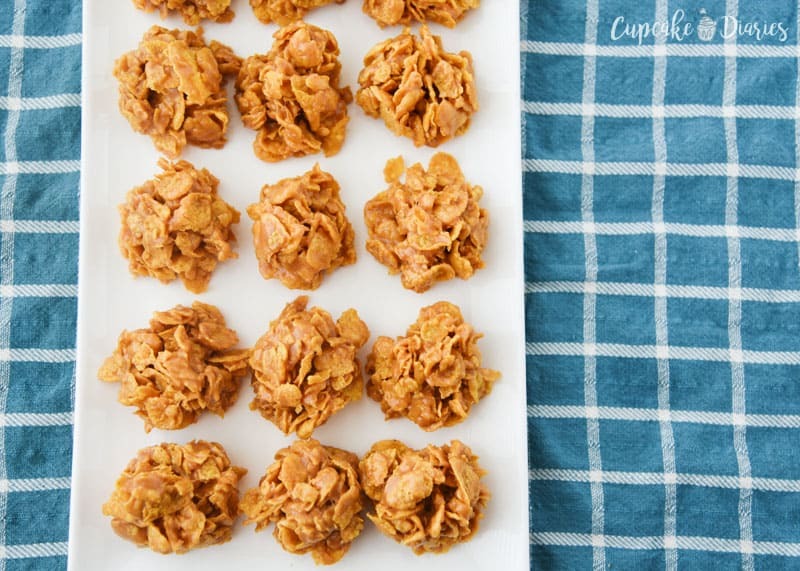 You can’t get much easier than chewy and delectable No Bake Peanut Butter Corn Flake Cookies! It really is a delight biting into one of these cookies. I was at my mom’s house this weekend when she was searching through her recipe card drawer in search of a specific recipe. She looked through the dessert section (where it was supposed to be but had zero luck finding it) reading off all sorts of yummy sounding titles as she went. After hearing two or three of the recipe names I started taking notes on a few I had to try and share. My childhood memories alarm went off when she read the name of this cookie. This was like the golden version of a no bake cookie. 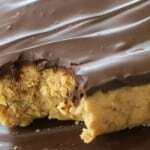 It was one of those desserts that wasn’t seen often, and when Mom made them it was a big deal. 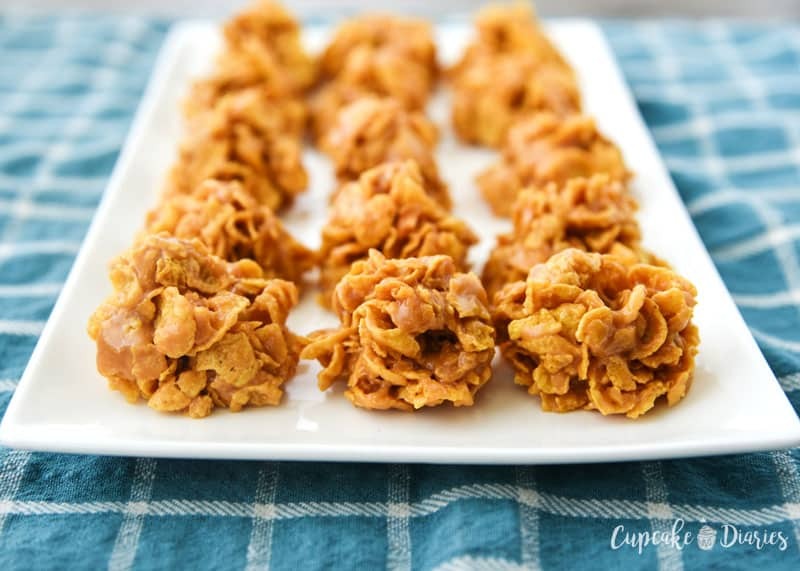 The sweetness of the corn syrup combined with the creamy peanut butter and crunchy Corn Flakes makes for a pretty sensational and heavenly little treat. It was like nothing I’d ever had as a kid. And even now just thinking about these babies makes my heart do a little dance. 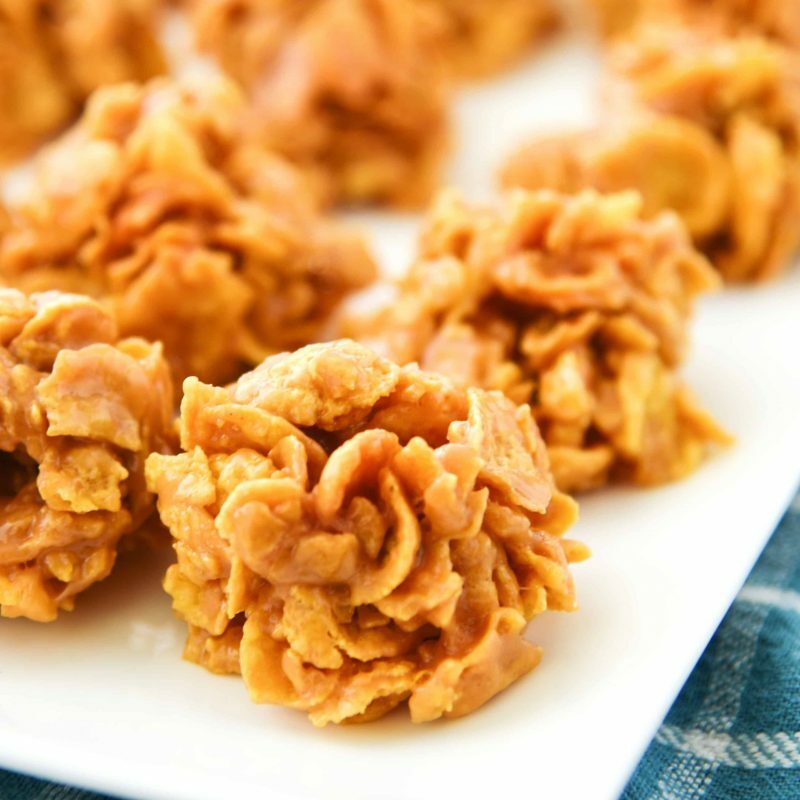 What are No Bake Peanut Butter Corn Flake Cookies? 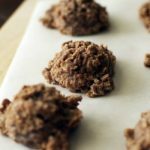 Imagine a Classic No Bake Cookie but easier and BETTER. 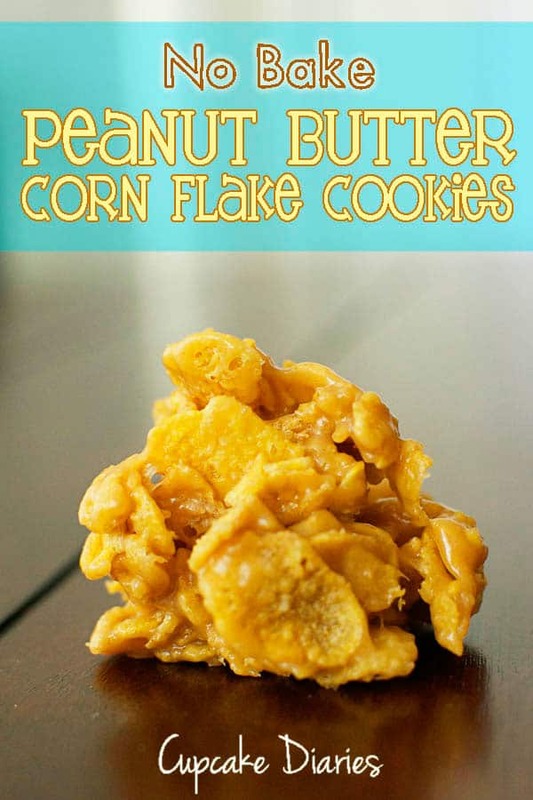 They’re essentially a mixture of peanut butter and sugary goodness tossed with corn flakes cereal. They’re so dang good!! 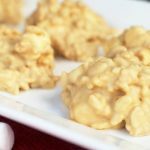 Speaking of Classic No Bake Cookies, I love these No Bake Cookies from Tried and Tasty and what she does with them after scooping them onto wax paper! Just look at the shape! Have you ever tried a cocount version? 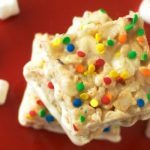 These Coconut No Bake Cookies are pretty stellar! Can No Bake Peanut Butter Corn Flake Cookies Be Frozen? Yes, and it’s a beautiful thing! Just layer them between layers of wax paper in a freezer-safe container so they don’t combine into one big ball. Not that that would be a bad thing; that actually sounds amazing. 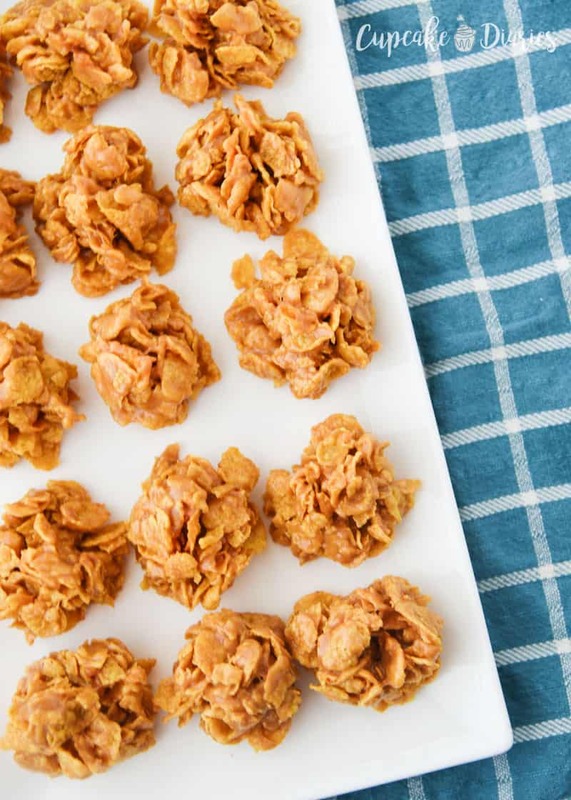 Is it Possible for No Bake Peanut Butter Corn Flake Cookies to Not Set? This is another beautiful thing about these cookies. You can’t mess them up! You just don’t want the sugar mixture to get too hot and start boiling or it will burn the sugar, but these little guys ALWAYS set up. High fives all around. And now, here is this super tasty and oh-so-easy recipe! Enjoy! 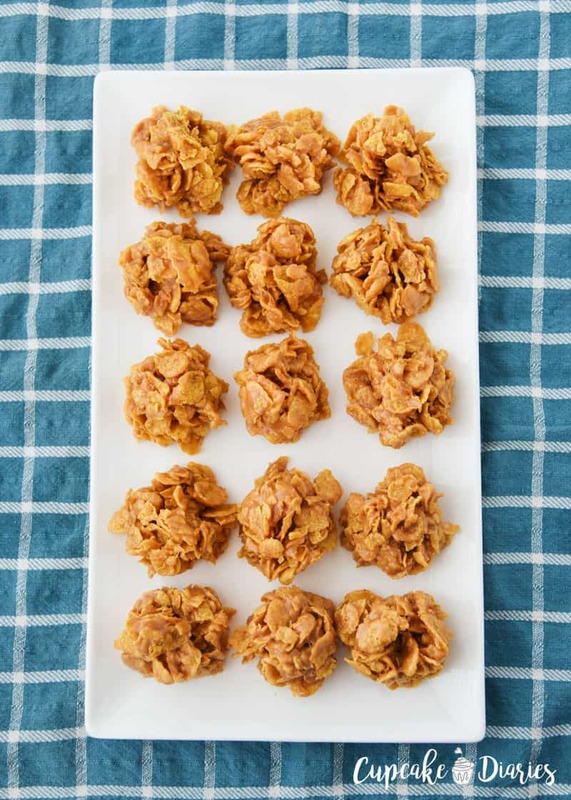 You can't get much easier than chewy and delectable No Bake Peanut Butter Corn Flake Cookies! It really is a delight biting into one of these cookies. Begin by placing a large sheet of wax paper on the countertop. Pour the Corn Flakes in a large bowl. In a small saucepan, heat sugar and syrup on medium heat and stir frequently till the sugar dissolves. Be careful not to boil it. Remove from the heat and stir in the peanut butter. Pour the sugar-syrup mixture over the Corn Flakes. Gently mix everything together until coated, being careful not to smash up the Corn Flakes. 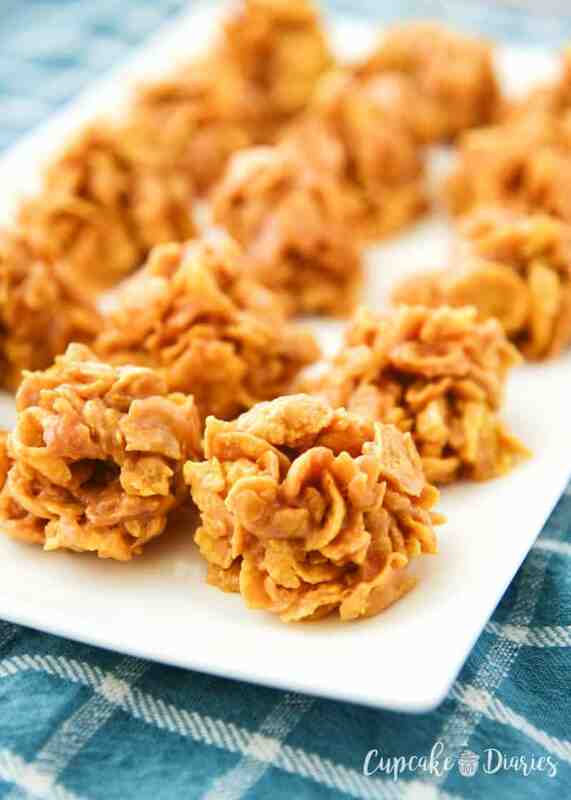 Drop Corn Flakes mixture by the spoonful onto wax paper. They will only take a few minutes to set. To store, cover in an air tight container and leave at room temperature or the refrigerator so they don’t melt. That would be tragic. Thank you! This brings back great memories of my childhood. Can’t wait to make them and share with my kids! Oh good, Kortney! That will be so fun to share something like this from your childhood with your own kids. Love it! I’ve been making this for 30 years. My grandmother made these for us when I was a little girl. My recipe is slightly different, but I am sure, just as good as yours. Bring to a boil over medium heat, stirring constantly. Boil for 1 minute and 30 seconds. Remove from heat, and stir in 8 cups Corn flakes. Drop by spoonful onto waxed paper. Enjoy while still warm, is my favorite way to eat them. That sounds great, Shannon! I’m so glad you liked the recipe. The difference in mine is I do bring the sugar & syrup to a boil & then I add 1 & 1/2 C Chunky Peanut Butter. Yum yum. It makes the texture a little harder. I love it! Thanks so much for the comment! I’ll have to try these with crunchy peanut butter sometime. Sounds great! Could you use dark corn syrup in this? I haven’t tried them with dark corn syrup, but I bet they would taste great!